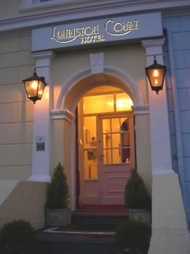 Lauriston Court is perfectly situated opposite the pier on Llandudno Promenade. With major shops and the beach just yards away, yet off main traffic highways you will find us the perfect location for your holiday or break. We offer a choice of family or double bedrooms and our attractive, bright and airy dining room offers a choice of hearty, full Welsh or the lighter continental style breakfast. Our attractive, bright and airy dining room offers a choice of hearty, full Welsh or the lighter continental style breakfast. We have a self service bar in our residents lounge. We have very comfortable Llandudno accommodation in a selection of double, twin, and family rooms, all tastefully appointed, decorated and furnished.